Home » News » Forget Brexit…Let’s Hit Vegas! There’s so much faff going on surrounding Brexit. Nobody’s entirely sure what’s going on. Even our own Prime Minister. So while we let Parliament sort it out, shouting out all their “raaars” in the House of Commons, we’re going to escape it all. We’re off to Vegas, baby! Thankfully we don’t need to jump on a plane to get to Vegas. We just need to jump on to our mobiles instead and enjoy Vegas in slot form. 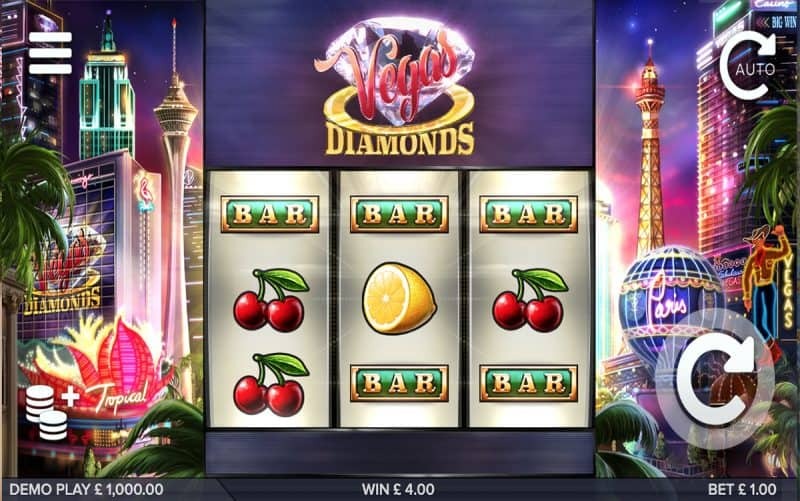 We’ll start by visiting The Strip on ELK Studio’s Vegas Diamonds, a simple three reel, five payline slot we see all the famous landmarks in a video at the top of the reels. Below we get the traditional Bars and Fruits symbols, just like we’d find in a Vegas casino. Though unlike a Vegas casino, we’ve got Multiplier Wilds, the Vegas Diamonds Fortune Wheel Feature which can give us up to 1,000 times our stake and Free Spins which can up that to 2,000 times. Of course, it’s not just ELK Studios that takes us up the Vegas Strip, with scores of slot developers using the iconic gambling city as a basis for their slots. Let’s mix it up a bit with Free Spin City – glitz, glamour and the perfect amount of neon appear on this five reel, 20 payline slot. We get four different game options by clicking on the casino chips, ranging from Power Spins to Ultra Spins to Mega Spins to the Reel Game. They say variety is key and that appears in abundance on Free Spin City! As do the big wins. We’re putting the shambles of Brexit behind us and heading to Vegas. You can join us too. Simply load up these mobile slots and enjoy. We can let the politicians make more of a mess of the shambles they have gotten us into while we go and enjoy ourselves.